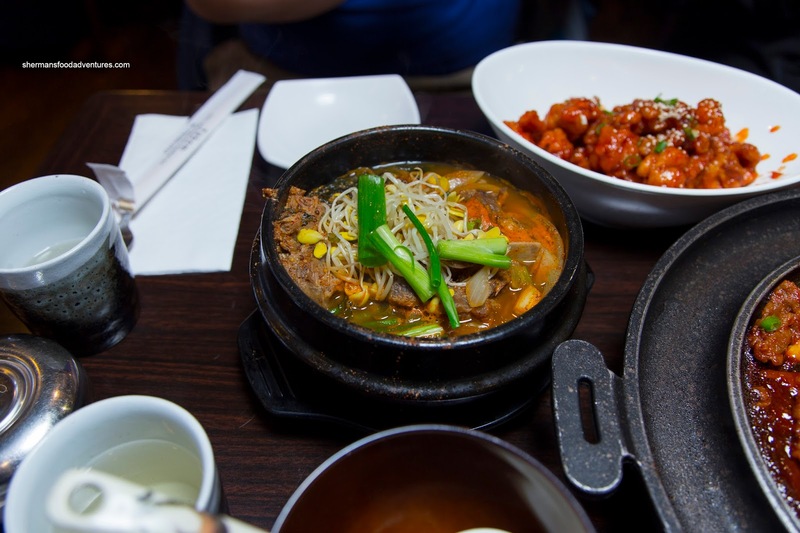 Many-a-time, we find the tourist approach to most of the ethnic cuisine we find in town. Never specific to one region nor really any rhyme or reason, we essentially find the greatest hits under one roof. So it comes as no surprise that the usual stuff is found on Korean restaurant menus such as mandu, japchae, bibimbap, BBQ, gamjatang and so on... 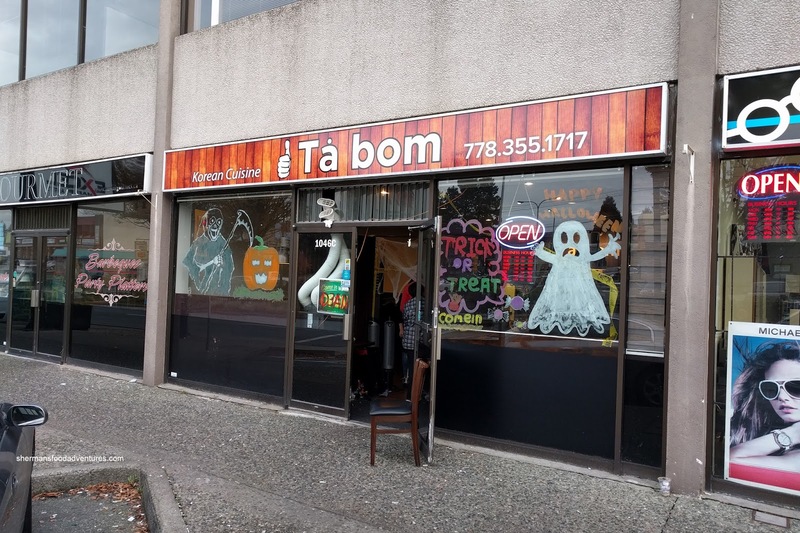 However, Ta Bom in Coquitlam has brought us the hot plate complete with main dish, and sides of egg, corn and cheese. If you have ever been to LA, then this is old hat, but for the rest of us, this has taken Vancity by storm (as evidenced by the long lineups). I joined Kirsty, Diana, Amy, Joyce and Nancy to try out this new type of BBQ out on Austin Ave (mind you, Kirsty and Nancy had already sampled it beforehand). 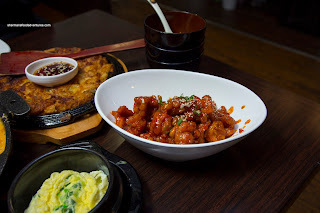 We ended up with 2 hot plates including the Bulgogi and Spicy Octopus with Pork. 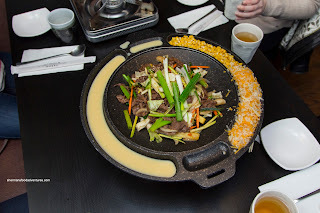 Slowly sizzling, the bulgogi was emitting an intoxicating aroma of caramelized beef. Picking up a piece and dunking it into the melted cheese, I got an ooey gooey bite with crispy beef bits giving way to sweet and tender thinly sliced meat. The fluffy egg on the side was texturally appealing as well as the sweet pop from the corn niblets. Saucy and spicy, the baby octopus were tender with an easy chew. There was also sweetness from both the octopus and the sauce itself. The rice cake was also a textural surprise hidden underneath the onions. After we were all done, the remaining spicy sauce and bits of pork were saved for the Fried Rice. Yes, we made fried rice akin to a dolset on the hot plate. Now we weren't able to do this with the bulgogi since there was no "sauce". Hence, make sure you order the right hot plate if you want rice later. After a brief wait, the rice crisped up and formed a chewy crust while it also soaked up the flavourful sauce. 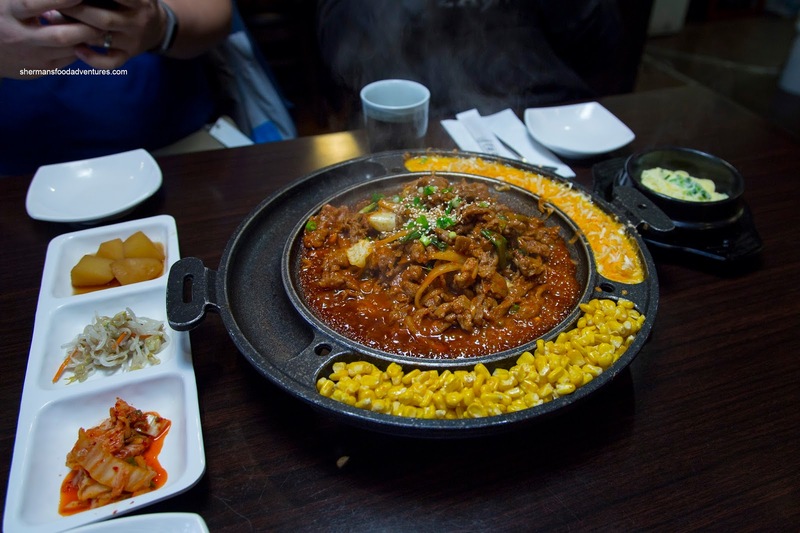 On another visit, we had the Spicy Pork Hot Plate with corn, cheese and egg. Unfortunately, they couldn't serve it on the butane burner due to some regulatory inspection thing. Hence, they heated it up in the kitchen and served it to us with the egg cooked separately. Suffice to say, the experience was not as good as the first time, especially without the option of the fried rice at the end. As for the pork, it was tender and aggressively dressed in a similar sauce as the octopus. It was sweet and slightly spicy. 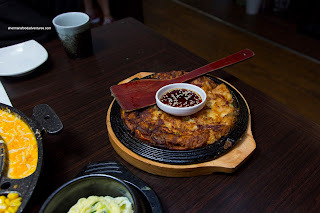 We also got the Seafood Pancake which was pretty thick and aggressively fried. Hence, the exterior was crispy while the inside was a touch doughy. 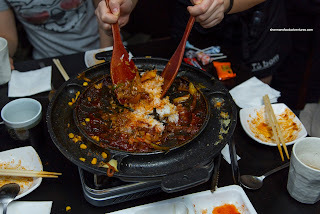 It was still decent though with enough seafood and conservative with the green onion. One dish I kept eating and eating was Mom's Pop Chicken. It featured tender nuggets of chicken that were lightly battered and nicely fried up. It was coated with a sweet gochujang sauce that was impactful being sweet, spicy and tangy. It went really well with the side of rice accompanying the Pork Bone Soup. About that soup, it was a bit thin in terms of flavour where it didn't have the aromatics we normally find in the soup. It was tangy from the veggies and had a light meat flavour. The pork bones themselves could've been more tender as well since the meat stuck to the bone. 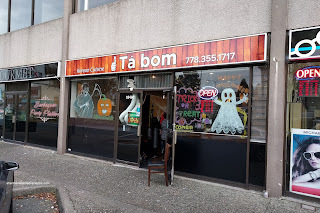 As you can see, the main draw at Tabom is the hot plate. The other stuff is decent, but nothing memorable. If you want the full meal deal (as in the burner), you will have to wait as they are scheduled to do renos in December. 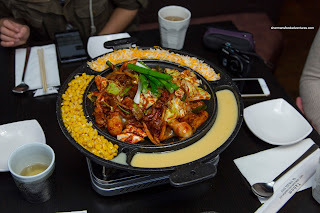 - Dat hot plate with cheese! - Dat fried rice at the end!